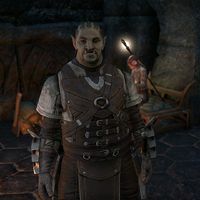 Szugogroth is an Orc who could be found at the outlaws refuges of Vulkhel Guard, Daggerfall, Davon's Watch, or Vivec as part of the related quest. He was formerly affiliated with Bulag Idolus and can be persuaded to give you the means to locate her, which can be found in his backpack nearby. "I don't know you. And I don't want to know you." I heard you know where to find Bulag Idolus. "I might, for the right price. But my loyalty is... expensive." "Huh. So you do know how this works. I searched her place the night she left town, but the only thing worth taking was some old papers. You paid well enough, so I'll let you look through them. Check my bag." Thanks. Pleasure doing business with you. "Abah's Landing? I heard there's opportunity there. All right. I stopped by her place after she fled town, but all she left was some old papers. They're in my bag―you're welcome to look through it. And put in a good word with your guildmaster!" "Whoa, wait! I didn't know you were with... Listen, I just took some papers from her old place. They're in my bag, right over there! Just leave me alone, all right?" This page was last modified on 4 November 2018, at 19:11.